Scientists have developed a test that uses cells from a single donor’s blood to predict whether a new drug will cause a severe reaction in humans. The test could avert disasters like the 2006 trial of the drug TGN1412, which led to six healthy young men being admitted to intensive care with multiple organ failure. The volunteers receiving TGN1412 experienced a catastrophic inflammatory reaction called a cytokine storm. Cytokine storm reactions are a particular worry for new biological therapies, or “biologics”, which use biological material such as antibodies. Many blockbuster drugs such as the cancer drugs Herceptin and Avastin are biologics, as are around a third of medicines in the pharmaceutical pipeline. Because these medicines are specific to humans, they can cause severe reactions that don’t materialise in animal studies, so tests on human cells are essential. However, cytokine storm side effects are hard to predict with tests were just one cell type is used, since they depend on interactions between blood cells and endothelial cells, which form the lining of blood vessels. But because endothelial cells are deep within the body, they are normally only grown from tissue removed in surgery or post mortem, or from umbilical vessels after birth. Because of this, current tests use endothelial cells taken from vessels of one donor, and white blood cells from a different donor. When cells from two different donors are used, one may have an immune reaction to the other, meaning the system is already primed for inflammation before the drug is added. This can result in the test falsely showing a severe immune reaction to a drug that is safe. 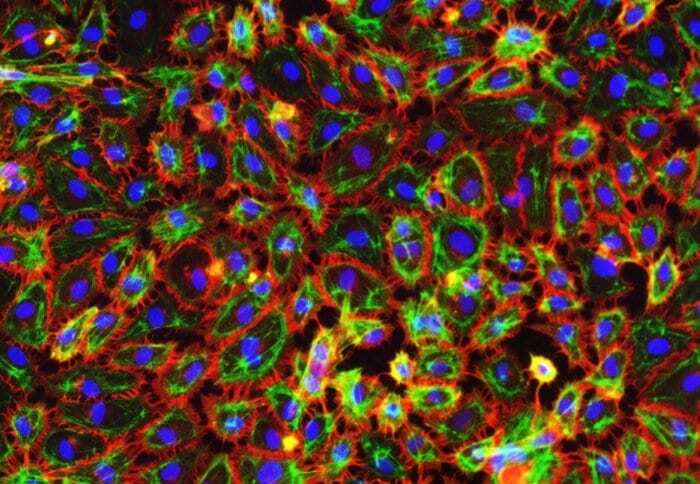 Researchers at Imperial College London got around this problem by isolating stem cells from the blood of a volunteer, and using them to grow endothelial cells in a dish. They then took white blood cells which they added to the donor’s own endothelial cells to recreate the unique conditions found in their blood vessels. When TGN1412 was added to the test tube, the mixture of cells released a cytokine storm, as would happen inside the body. The new method is better as it only requires blood from one donor and doesn’t mix cells from different people, with the advantage of making a more reliable test. Professor Jane Mitchell, from the National Heart and Lung Institute at Imperial College London, who led the study, said: “As biological therapies become more mainstream, it’s more likely that drugs being tested on humans for the first time will have unexpected and potentially catastrophic effects. We’ve used adult stem cell technology to develop a laboratory test that could prevent another disaster like the TGN1412 trial. April 15, 2019 - The Need to Demonstrate Value in the Life Sciences Sector and the Impact on Intellectual Property - The Latest Legal Features, Research and Legal Profiles Who's Who LegalGlobal spending on health continues to rise, such that it represents an ever increasing and significant percentage of any country's gross domestic product. March 25, 2019 - Gene therapy - high promise, high risk? PharmaTimesJames Huang and Stephen Huang consider the promise and risk of gene therapy - Magazine Article - PharmaTimes. April 11, 2019 - LEO Pharma and Research Project BIOMAP: Towards Personalised Medicine for Inflammatory Skin Diseases Business WireLEO Pharma, a global leader in medical dermatology and BIOMAP, a EU-funded research project (Biomarkers in Atopic Dermatitis and Psoriasis), today ann. Can artificial intelligence predict premature death?